The social and economic conditions in Mexico and India changed significantly in the mid nineteenth century. During this period, the construction of railroads impacted millions of people. The rural culture of these countries changed drastically. 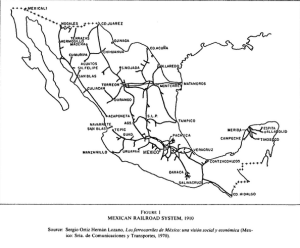 The development of the railway systems in Mexico and India is historically controversial. Railroad development caused political instability in both countries but also was responsible for economic growth, and temporal standardization. The following two photographs are pictures taken of Mexican railways during the nineteenth century. As you can see in the photos, the surrounding land areas are vast and desolate. In the first photo, there are men on horseback who are most likely working for the government in order to oversee the construction. This can be interpreted as possibly one of the rural areas of the land that was acquired by the government under the expropriation law of 1882. In the second photo, the railway runs directly through the countryside which appears to be woodlands or forest. Construction of the railway structure disrupted natural animal and plant ￼habitats and destroyed small farming communities. 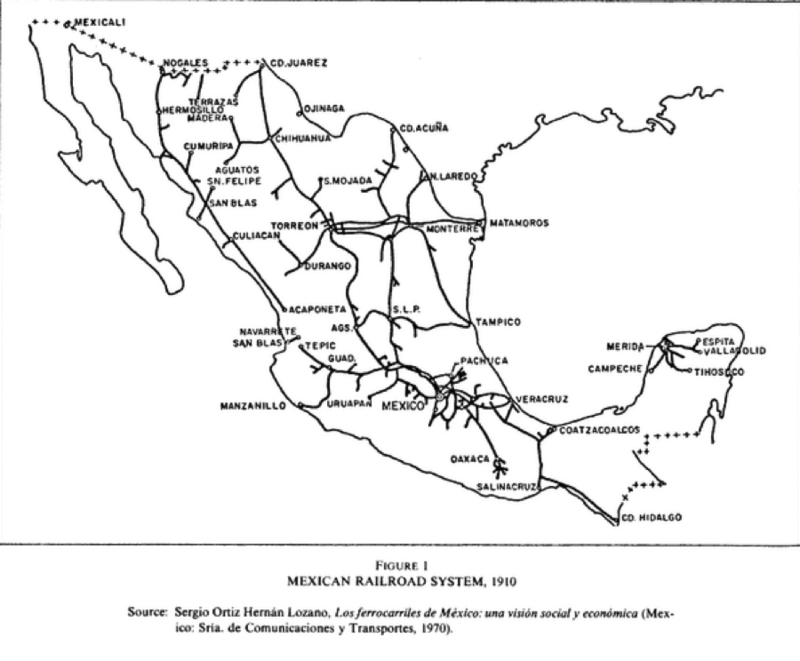 ￼This next photograph is of a map of the railways in Mexico in 1910. You can see the different stops the railways would take, connecting various cities. Although there seems to be an abundance of train routes, if you look at the distance between lines across the country, you can see how far away they are from each other. What is also noticeable are the large areas of land in which there are no railway tracks going through them at all. These barren areas are an example of how railways in the 1920’s were becoming a less utilized form of transportation. The purpose of the railways in India was to make trade and travel easy and cheap. 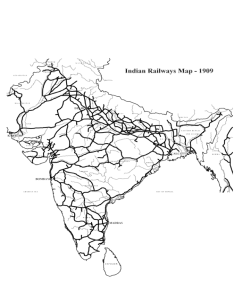 The initial and biggest advocates for this new rail system in India were the British. The British believed that by creating this rail system, it would open up an easier trading market for them to buy and sell cotton products. What the British didn’t realize was, in addition to cargo travel, there was a need for easy passenger travel in India. Providing an accessible travel mode would lead to major revenues in the latter half of the 18th century. (Chaudhary). The first passenger train in India was constructed in 1855 and measured twenty miles long. (Prasad p.1254) This railway connected the port of Bombay to Thana. By the 1900s, India’s railways system was the fourth largest in the world; however, this was not adequate in relation to the amount of people that lived in India during this time. 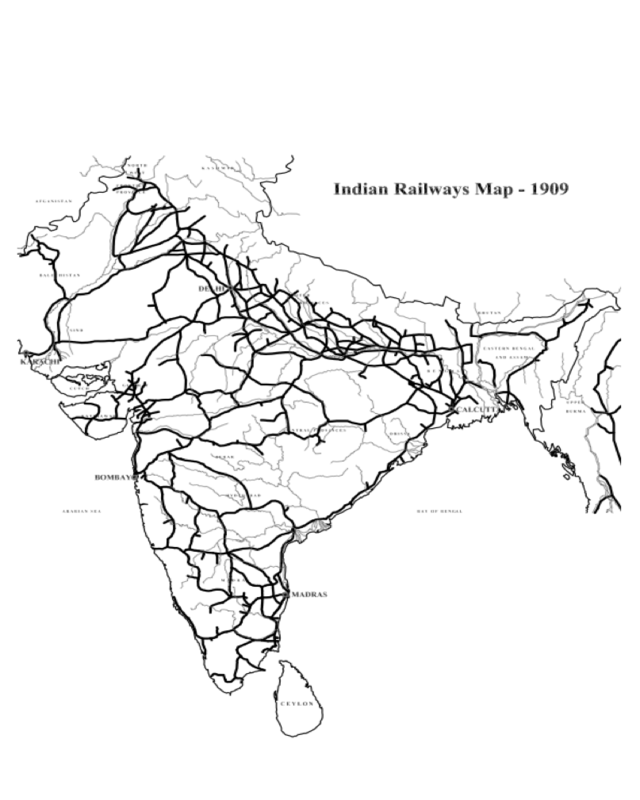 The Government of India (GOP) was in charge of placing the routes, despite the fact that private companies were the ones constructing the rail lines. One main reason for the specific placement of the rail lines was the ￼military presence in India. Strategy and military concerns influenced where the lines would be placed and which cities would receive railway stations. ￼relate time in a standard fashion. Each community was able to officially coordinate with each other. The following chart shows the numbers of injuries and deaths in relation to the amount of accidents that had occurred during that time. 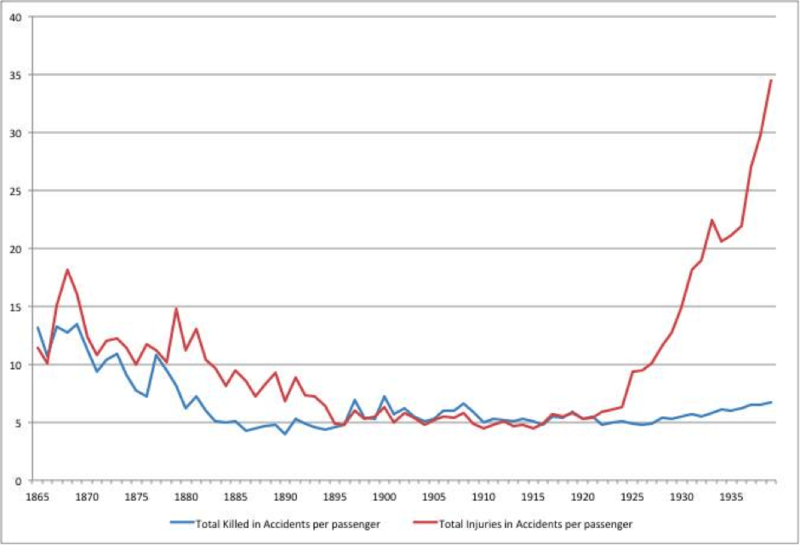 As seen in the chart, safety continually increased as the years went on and train productivity increased. 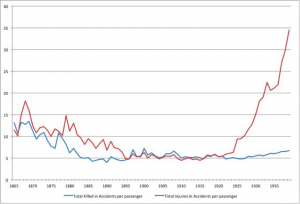 The numbers of accidents, deaths, and injuries due to railway accidents were typical for countries during this time period. (Chaudhary p.25). 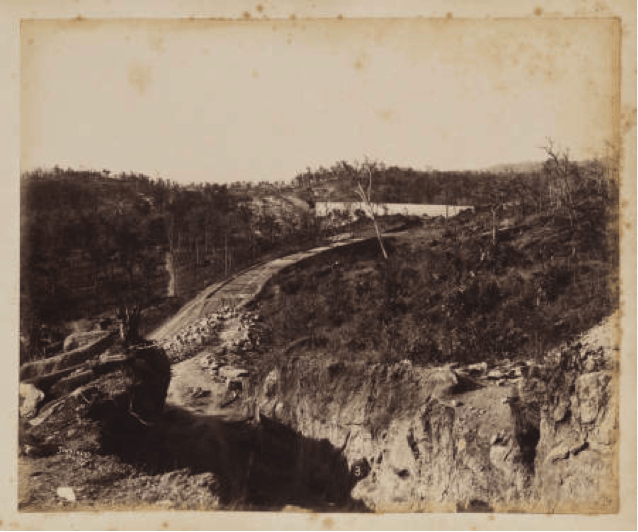 Above is a photo an Indian railroad construction site of the Benghal Nagpur Railroad Construction (1890). 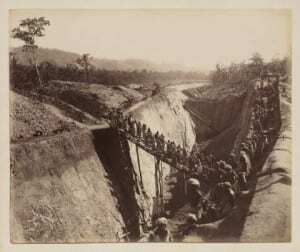 ￼Construction of the railway system in both India and Mexico created social conditions that divided the country with the elite prospering and the lower class suffering. However, the development of the railroad modernized and enhanced the economies of both countries immensely by enabling efficient trading methods with foreign markets. 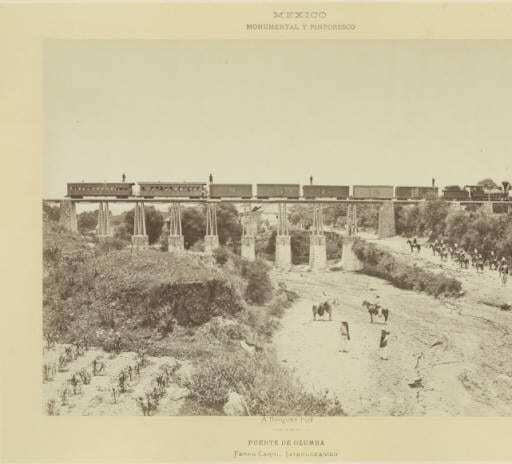 The significant changes that occurred in Mexico and India, socially, economically and politically, were a direct result of railroad expansion in the mid nineteenth century. Van Hoy, Teresa M. “La Marcha Violenta? 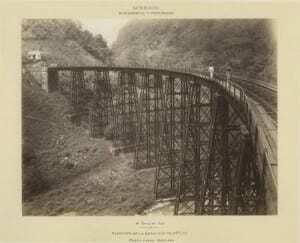 Railroads and Land in 19th Century Mexico.” Bulletin of Latin American Research. University of Texas at Austin, Tx, USA, 1 Sept. 1999. Web. 6 Apr. 2015. Coatsworth, John H. “Indispensable Railroads in a Backward Economy: The Case of Mexico.” Www.jstor.org. Cambridge University Press, n.d. Web. Apr. 2015. Chaudhary, Latika and Bogart, Dan. “Railways in Colonial India: An Economic Achievement?.” Available at SSRN 2073256 (2012). Kerr, Ian J. “Colonial India, Its Railways, And The Cliometricians.” Journal Of Transport History 35.1 (2014): 114-120. Academic Search Complete. Web. 7 Apr. 2015. Bogart, Dan, and Latika Chaudhary. “Engines of growth: the productivity advance of Indian railways, 1874–1912.” The Journal of Economic History 73.02 (2013): 339-370. Arnold, David. “Industrial violence in colonial India.” Comparative Studies in Society and History 22.02 (1980): 234-255.